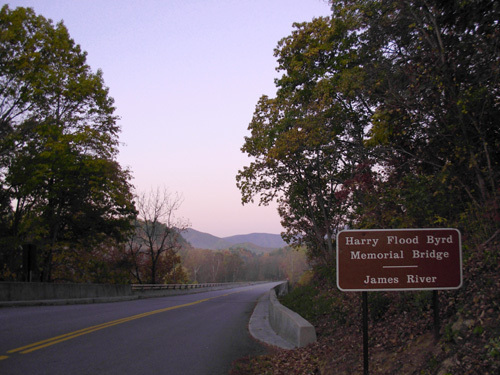 " COURSE: Beginning at the James River Visitor Center, runners cover a short out-n-back section on the Blue Ridge Parkway before completing a few short miles of road. 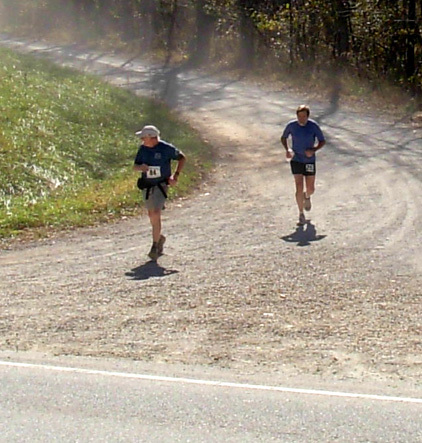 The course then meanders northward over various dirt and gravel roads in the National Forest before runners have to negotiate the second half of the course. Leaving Long Mountain aid station, the second half includes dirt & old logging roads as well as several miles of beautiful single track trail. Many say the race is just beginning when you leave Long Mtn. 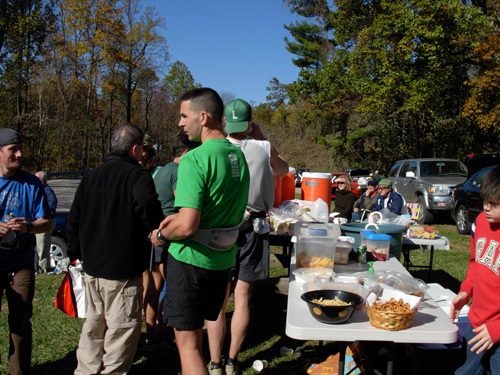 Upon reaching the last aid station at Porters Ridge, runners course downhill for 2.9 miles toward the finish in Montebello. 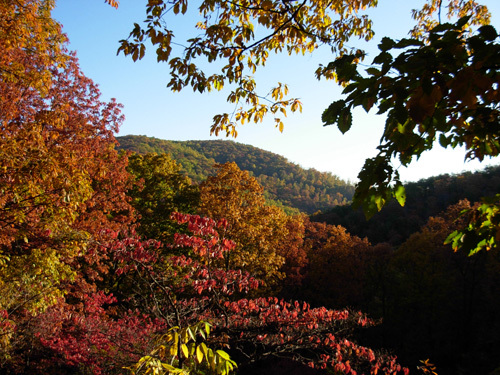 The entire MMTR course traverses some of the most beautiful areas in the Blue Ridge right around peak fall foliage." 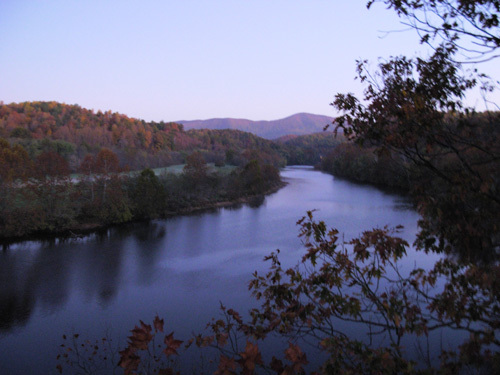 Indeed it was beautiful last Saturday as 229 ultra runners coursed through the Blue Ridge Mountains during the Mountain Masochist Trail Run (MMTR) 50+ miler. 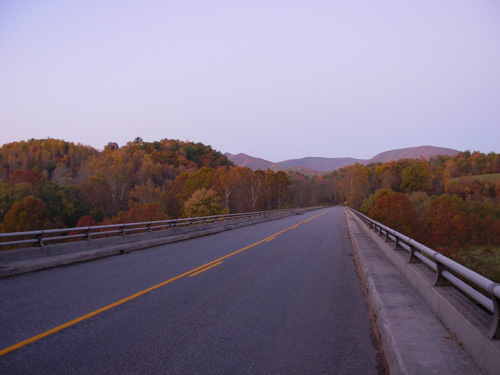 Although I wasn't on much of the course myself, I'll include some scenic photos here that I took at the start, at two aid stations, at the finish, and along the Blue Ridge Parkway as I traveled from the James River to Montebello. It's an aptly-named range of mountains, isn't it? 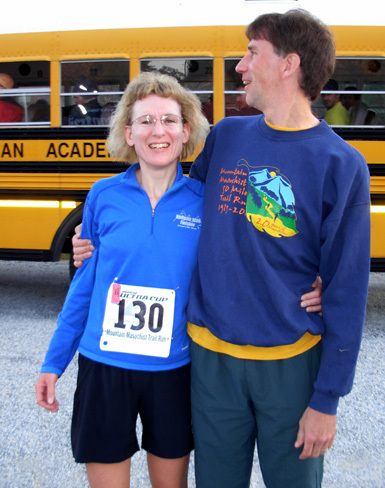 I introduced the race in the last entry, talked about Jim's and my history with the race, outlined his training, and showed photos from a training run he did with one of our Roanoke friends, Steve Bowles. 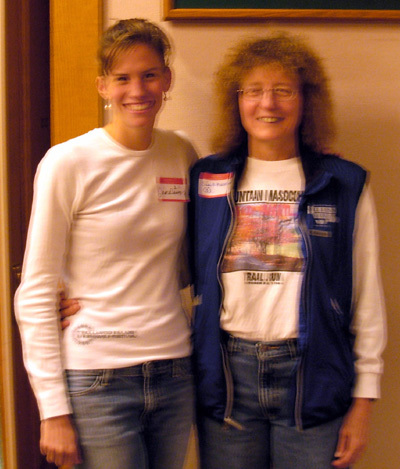 This is about the tenth year that either or both of us has been involved with the race as entrants, crew, and/or volunteers since 1992. 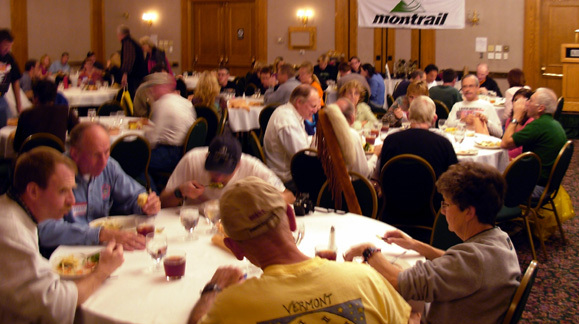 Although there have been subtle changes to the race over the years under the directorship of David Horton, the 26th edition of MMTR marked the beginning of a new era for the race. David conceived this race in 1983. 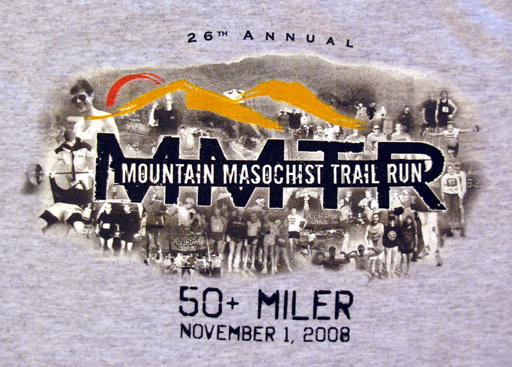 Nancy, his long-suffering wife, is credited with naming both the race and the participants "Mountain Masochists." 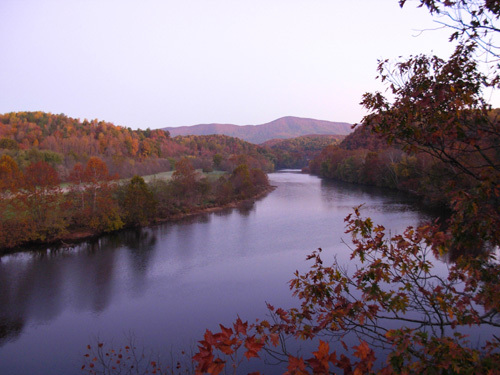 Even as the race grew and the Hortons' responsibilities grew with it, David gradually added three more races to his series based within an hour of Lynchburg, VA: Holiday Lake 50K+ in February, Promise Land 50K+ in April, and Hellgate 100K in December. Fortunately, David has a loyal group of volunteers, an energetic administrative assistant, and lots of college students in his classes who are willing to assist with all these races. 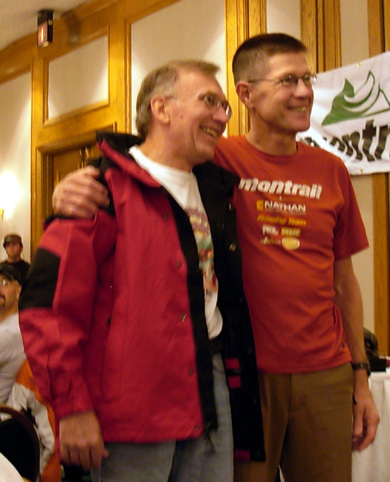 But much of the burden fell on his wife, especially during the years David was running across the USA (1995) and setting records on the AT (1991) and PCT (2005). This year, Nancy finally got her wish for David to pass on the responsibilities of MMTR to someone else. It was an interesting bargain. I remember David saying that the 2002 race, the 20th anniversary, would be his last because Nancy wanted him to give it up. I didn't hear anything about whether it would be passed on to someone else or whether it would just be a memory. Those rumblings were the impetus for Jim and me to fly to Virginia from Montana for the race in 2000. I wanted Jim to experience MMTR while it was still under David's directorship. He enjoyed the race that year -- his only finish on the course. Fast-forward to 2007. 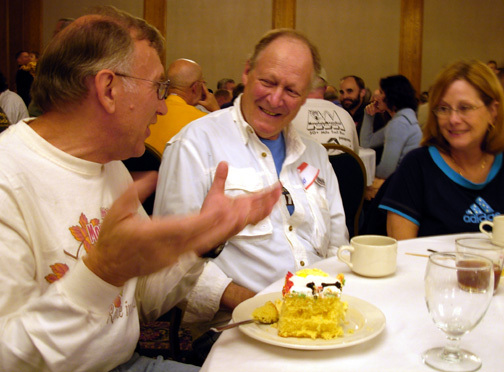 David had a new plan to announce: in a bargain with Nancy, he agreed to give up directing MMTR and Nancy agreed to "let" him try to set a speed record on the Continental Divide Trail (CDT) the summer of 2008. It was a win-win. The arrangement called for Clark Zealand, one of David's former students and now a teaching peer at Liberty University, to assist with the RD duties at the 2007 race and take it over in 2008. Clark also employed the assistance of his brothers, who are all involved in an ecological-minded race directing venture called Eco-X Sports. 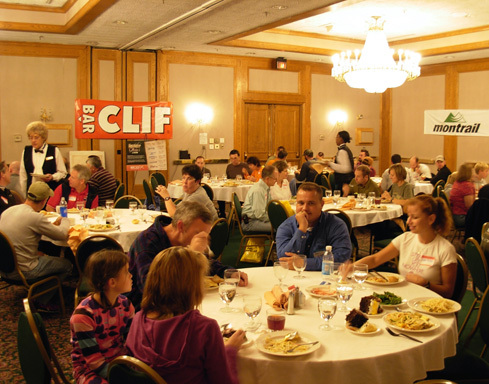 One of the biggest changes this year was a new venue for the pre- and post-race activities (dinners, packet pick-up, awards ceremony): the very nice Kirkley Hotel, where Clark arranged for good discounts on the rooms. Not only did we much prefer the Kirkley to the other nearby motel where we've stayed a few times for this race, we also appreciated the convenience of not having to drive to one of the high schools for the dinners and awards. It was great to simply walk downstairs to check in (above) and eat dinner Friday night. It's even more convenient for folks who fly in for the race. They don't need to rent a car or hitch rides with other runners now to get to the dinners or catch the buses to the start. Clark also arranged for two rooms to be open after the race for runners who weren't staying at the Kirkley on Saturday night so they could take showers before dinner. Although we live only 45-50 minutes from Lynchburg we chose to stay at the Kirkley Friday night so Jim wouldn't have to get up quite as early for the 6:30 start Saturday morning. We checked into our handsome, spacious room about 3 PM and just relaxed. Cody got to come along with us because he travels well and is a great "crew dog." There was a nice park-like area behind the hotel for him to roam around when he needed to stretch his legs and he was cozy sleeping in our Odyssey van all night., even though it got chilly outside. Jennifer has run the race previously but was here this year to crew for David. I got to talk with her again at Hwy. 60 and the finish. I thought the food prepared and served by the Kirkley was superior to that in previous years; as you'd expect, some folks told Clark they didn't care for it as much. You can't please all of the people all of the time . . . The fare was more upscale (e.g., portebello mushroom lasagna instead of basic meat lasagna for one of the entrees). Diners efficiently served themselves from four buffet lines in two rooms across from the dining room. After Clark's presentation we talked to a few more friends, walked Cody and said good-night to him, and went up to our room. We were in bed in time to get about seven hours of sleep. Even though we were closer to the race start than driving from home, we still had to get up at 4:15 AM to beat the runner buses out of the gate in the morning. Ugh. 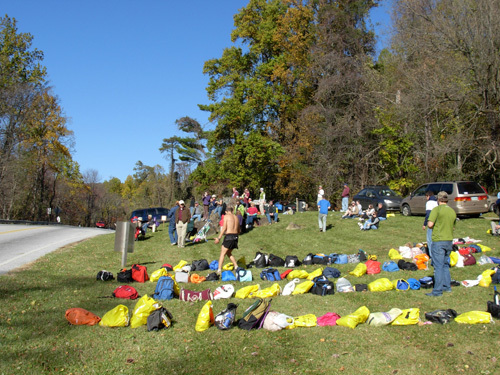 On Saturday morning we got down to the van to walk Cody around before several buses arrived in the Kirkley's large rear parking area arrived to carry many of the runners to the start of the race at the James River Visitor Center on the Blue Ridge Parkway. Steve Michael and Steve Bowles rode with us to the start. 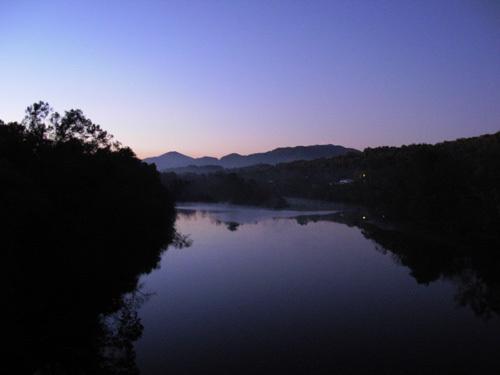 We thought we knew the way, but soon got a little lost in Lynchburg and returned to the Kirkley to follow the first bus when it left at 5 AM! The buses go a different way than I remember going previously, and they are tediously slow, but at least we got to the start early enough to get a good parking spot. Then we had to wait about 40 minutes for the race to begin. It was clear but chilly so we stayed in the van most of that time. Clark sent the runners off promptly at 6:30. It remained dark another half hour or longer. The 12-hour time limit ensures that runners get done before dark Saturday night (soon after 6:30 PM). This year's race was one day before the time changed. Clark has to change either the date of the race next year or the start time, as the first Saturday in November, 2009 is apparently after Daylight Savings Time ends and it will be dark by 5:30 PM. I kissed Jim good-bye and bade him a good race right before he and the two Steves positioned themselves in the crowd of runners. 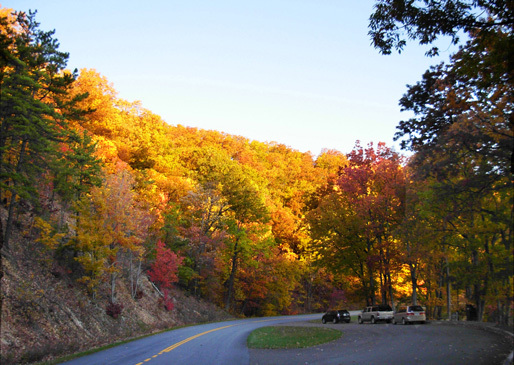 Everyone headed north on the Blue Ridge Parkway for about a mile and a half before turning around and coming back to the start. Although neither of us is fond of this section, Jim was in good spirits and keeping his intended pace when he came back after about three miles. He tossed me his jacket and was on his way across the long James River Bridge. 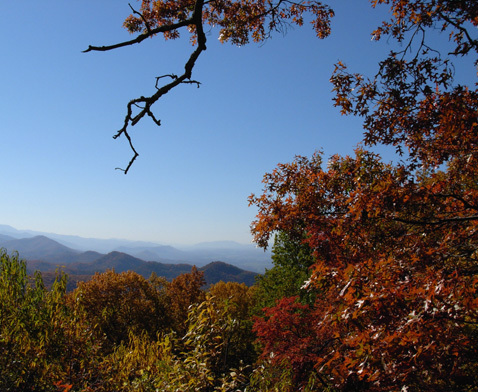 Above 4,000 feet, many of the leaves were down but they were at or near their peak on race weekend from about 2,000-3,000 feet. I hope the runners were able to appreciate the beauty around them. I wandered a quarter mile down the parkway to the "Parkway Gate" aid station, which is located about 15 miles into the race course. I'd never visited this one before and wasn't able to wait for Jim to come through, but spent a few minutes talking to the radio guy and other volunteers, below, as they waited for the first runners to reach the aid station. Since dogs weren't allowed at aid stations, I left Cody in the van; he got several walks away from aid stations during the race. Sean finished in the top ten as usual. NOW THE RACE REALLY BEGINS! After Sean passed through I headed on up the parkway to the Hwy. 60 aid station. I had promised Mike Hall (AS captain) and Annette Bednosky that I'd help them at that aid station while I was waiting for Jim to come in. 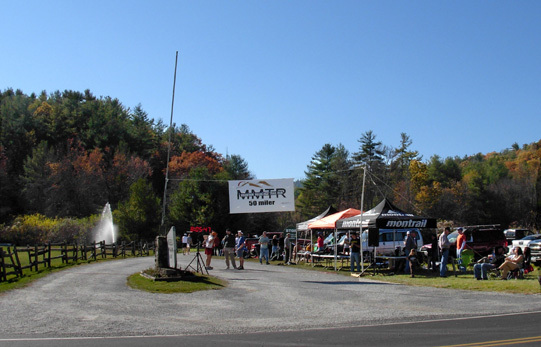 As mentioned in the last entry, this aid station at Long Mountain Wayside is about halfway through the race (26.9 Horton Miles = probably farther) and is the most tempting place for runners to drop out voluntarily, especially if they are pushing the cut-off. This is the last place where an aid station captain has discretion to allow a runner to continue if (s)he is just past the cut-off. 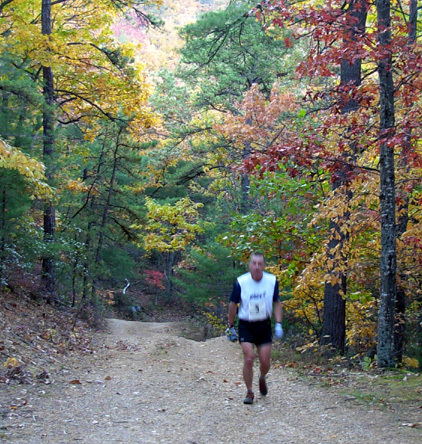 Runners know they are only half-way up the long trudge to the top of Buck Mountain and the highest sections of the course. They are tired and they've heard this is where the race really begins . . .
And those buses are so doggone inviting, just sitting there waiting to take runners back to the finish line early! Steve Michael re-supplies at our van at Hwy. 60. Four buses are in the background. Fortunately, most of the runners made it to Hwy. 60 in time and continued on toward the finish. Jim was even able to make the 2+ mile climb to the Buck Mountain aid station about as fast as he did it on his training runs. but well before any runners came through (I took the photo above later in the morning). Mike and the other volunteers were just putting the finishing touches on the aid station. Cody and I went for a little walk in the woods before I began a three-hour volunteer stint. I was parked close enough to the aid station to check on Cody occasionally and set out Jim's and the two Steves' drop bags. You can see our tan Odyssey in the photo above. I've helped in various ways at this aid station before -- at the aid station itself, at the highway (where traffic whizzes by), retrieving drop bags, directing runners up the right trail beyond the aid station, etc. 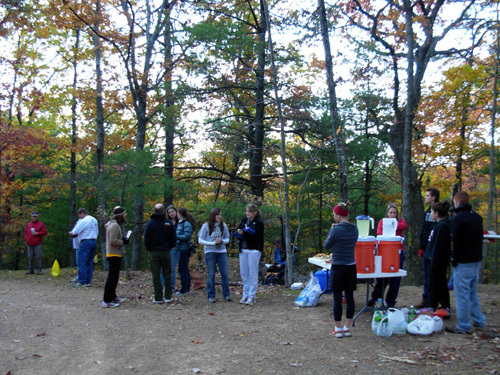 This year I mostly assisted runners right at the aid station. I pretty much did whatever was needed at the aid station, keeping it re-supplied, letting runners know what was available to eat and drink, filling water bottles and bladders, answering questions, and giving encouragement. 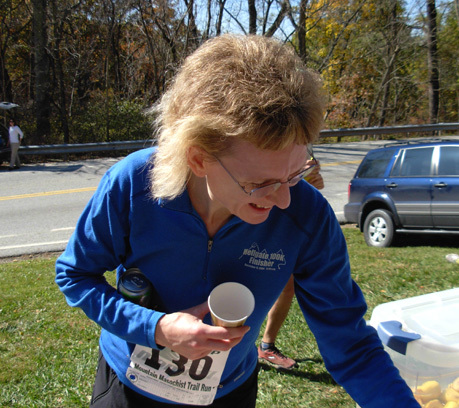 Most runners know what they want and try to get through the aid stations as quickly as possible. Some need reminders about hydration, calories, and electrolytes -- or need to be prodded to get going more quickly! 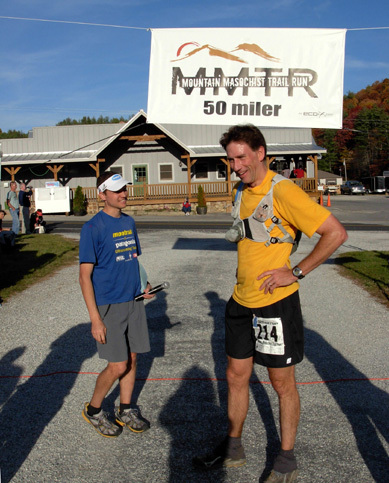 With his MMTR finish, Jay has completed the first five races in Clark's and David's new Beast Series; he has only Hellgate 100K in December to go. Anita came in a few minutes after Jay. She's always smiling! 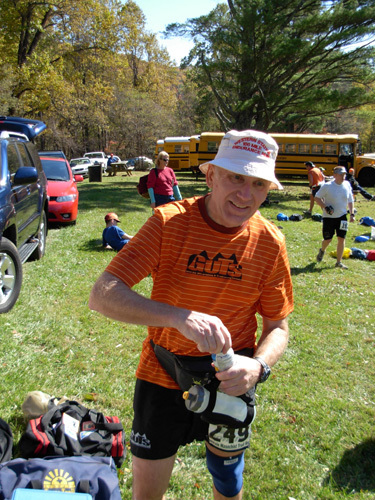 Jim gets his empty bottle out before reaching the aid station, a good way to save time. Even though runners were allowed some leeway here, I was prepared for Jim to possibly drop. He'd be under a lot of pressure to continue beating the cut-offs all afternoon. However, he was determined to keep going and get 'er done. He still felt strong and he looked good! He didn't need any encouragement to to go on. Jim and I swapped bottles quickly and he was gone up the mountain in a flash. As we waited for the remaining runners to arrive we began to tear down the aid station. 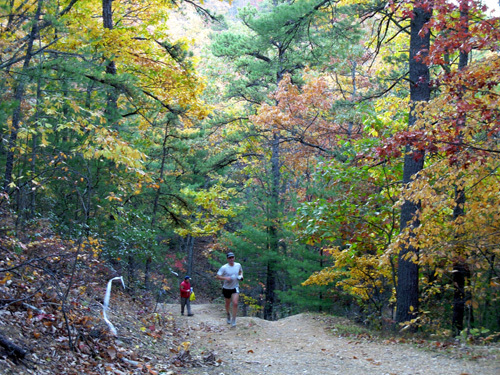 Several more runners were allowed to continue up Buck Mountain. A few were well enough beyond the cut-off that they were pulled from the race. One man was particularly dejected, but didn't argue with Mike or Annette -- that's a good way to sabotage getting into the race in the future. The remaining cut-offs in the second half are strictly enforced so no one is still out on the course after dark. That's inconvenient for the volunteers and race officials, and dangerous for the runners if they don't have lights. 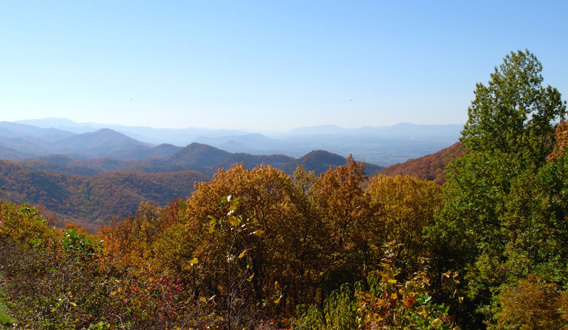 I helped pack up the aid station, then ate some lunch, took Cody for another walk, and set out north on the Blue Ridge Parkway once again, this time to the finish at Montebello. I considered driving to The Loop aid station so I could crew Jim at ~ 33 and 39 miles but decided he didn't need the temptation of a convenient vehicle! I figured he'd be more motivated to keep on running if he was close to a cut-off up there, knowing it'd be a long wait to get off the mountain with the volunteers. Several runners had already finished by the time I got to Montebello. I parked near the finish canopies, shown in the photos below, and found Clark right away. He was present all afternoon to welcome the runners home. I could see there wasn't anyone handing out the finisher shirts, so I volunteered my services. Clark was happy for the offer. I handled that job for over four hours until the last runners came in. Soon after arriving at the finish I gave the radio operator Jim's race number and asked if he had dropped from the race. I knew he was running close to the cut-offs but didn't realize how fast he'd made the climb up Buck Mountain. He told me later that he made up time getting to the next two aid stations, increasing his cushion before reaching the inbound aid station at the Loop. The radio guy didn't have his number -- that was good because it meant Jim was still in the race. 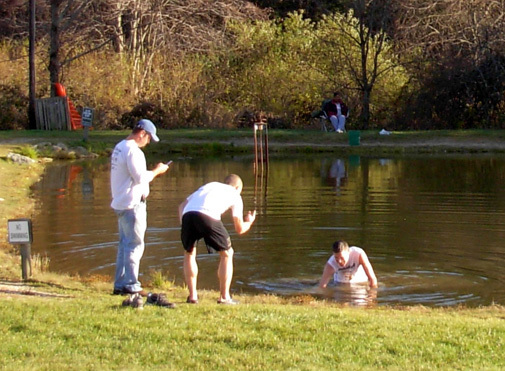 Although it was sunny and in the 60s when he came in just before 3:30 PM, I'm guessing that water was pretty chilly! This was only the second time he's been able to run the race, after all those years directing it. 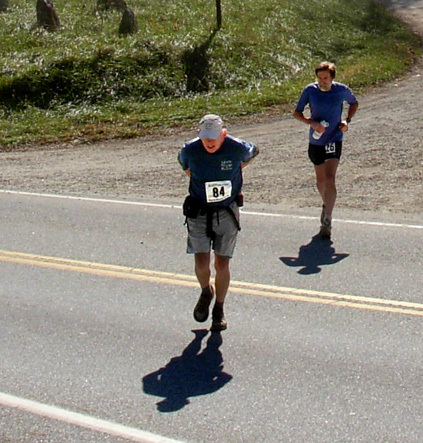 He finished in 9:56 hours, placing 54th of 182 finishers under 12 hours. He was __th in the M50-59 age group. 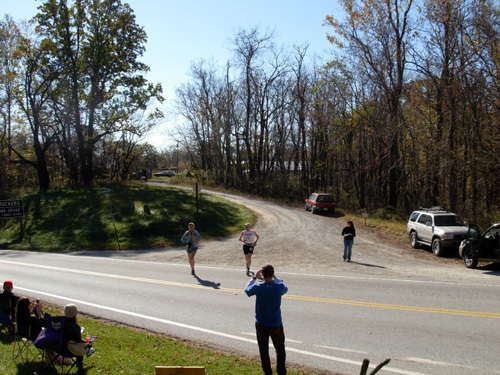 Soon after the 4:15 PM cut-off at Salt Log Gap the radio guy notified me that Jim had been pulled at that aid station 41.5 Horton Miles into the race. Rats! (No, that's not exactly what I said to myself.) Deja vu all over again. 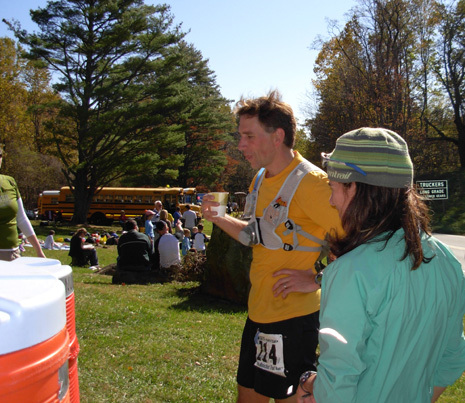 Just as in 2004, he was a few minutes past the cut-off at this aid station. Several things went through my mind. I wondered what happened. I wondered how and when he'd get to the finish. I wondered what frame of mind he'd be in when I saw him. Most of all, I empathized with the frustration I knew he was feeling. In the last entry I mentioned how many runners traditionally finish the race in the last hour, recently 35-42% of the runners under 12 hours. This year that percentage would be even higher: 79 of 183 runners finished between 11 and 12 hours, a whopping 43% of the total. Another three came in after 12 hours, for 44% if you count them, too. No wonder I was very busy that last hour tracking down the runners to give them their shirts! That was also when Jim got back to the finish on one of the buses that transported runners who dropped or were pulled from some of the aid stations near the end of the race. I didn't have much time to talk to him until the ride back to the Kirkley Hotel. He got some hot chili at the little store across the road and got into some dry clothes while we waited for the two Steves to come in. We were getting a little concerned about them as the clock ticked closer and closer to the 12-hour cut-off. Then we saw Steve Michael approaching the finish line -- he made it with just over eleven minutes to spare! Steve Bowles was a few seconds behind. Whew! As close as those two were to the 12-hour cut-off, another thirteen runners came in after them -- ten more under 12 hours, three just over (two by mere seconds). The last three have official finishes but didn't receive the nice black technical shirts reserved for those under 12 hours. At 6:30 I put the remaining shirts in a box and headed back to Lynchburg with Jim, Cody, and the two Steves. We were all pretty tired from a long day working and playing in the mountains. I got to hear more about how Jim's race went during the drive to the awards ceremony (and dinner, even more important to us at that point!). Apparently the only thing that went wrong was his inability to run fast enough. He had no problems with his feet or stomach. He was in good spirits and motivated to finish. Although he was two minutes behind the cut-off at Hwy. 60 (~ 27 miles), he made up 15 minutes on the cut-off by the time he got to the Loop at ~ 34 miles. He lost most of that cushion in the notorious Loop and by Salt Log Gap (41.5 miles, officially), he was about four minutes behind the curve. There was no leeway allowed at these later aid stations, so he was out. Jim withdrew graciously without argument, unlike another runner who was two or three minutes over the time limit and continued on against orders to stop and with full knowledge he was jeopardizing his chances to ever run the race again. That runner later returned to Salt Log Gap via a pick-up truck. We don't know if he turned around on his own volition or if someone was dispatched to pick him up. Jim hasn't seemed too bothered by another DNF at Mountain Masochist. He says he isn't likely to enter it again. Even though he came close to finishing once again, this race is stacked against slower runners. He may not be able to resist the challenge, though. I won't be surprised if he enters it again and I certainly won't discourage him from trying. We enjoyed the post-race dinner at the Kirkley as much as the pre-race meal. Well, except for the announcement that a door was open on a van with the license plate "RUN LONG." Uh, oh. That's us! Jim rushed out right away. It took me about 15 seconds longer to realize what that meant -- Cody was in the van! Or I HOPED he was still in the van. Did he get out to explore or follow someone? Did he get lost? Did someone take him? Heck, he'd probably go with anyone who offered him some food! We were parked near a walkway and it was likely that several people had walked right past our car on their way into the hotel. Did the person who reported the open door see Cody inside? By the time I finally reached the door to the back parking lot, Jim was on his way back in. One of the sliding side doors of the van had been left open and we didn't notice it in the dark in our hurry to get inside for dinner. We don't know if Cody did any exploring, but right now, he was sound asleep in the van as if nothing was wrong! What a good boy. Jim patted him, said goodbye, and closed/locked the door. We were very relieved that little incident had a happy ending. Jim and I went back inside to finish our dinner, shake our heads for a while about how lucky we were, and tell our friends what a great dog we have! Other folks didn't think their dogs would have stayed inside like that. I joked that Cody knows how good he has it with us, and he'd be foolish to run off. Once most guests were done eating, Clark began the awards ceremony. There were more nice products from sponsors given out randomly. Awards that are unique to MMTR or other "Horton Races," such as Best Blood, Fastest Fat Boy and Fat Girl, and fastest local male and female runners, were presented. 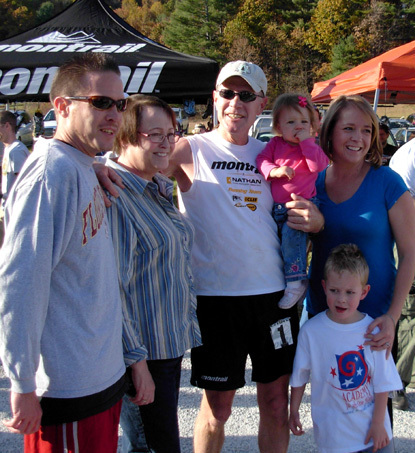 Clark and David also awarded the top ten male and female finishers, age group winners, and LUS (Lynchburg Ultra Series) finishers. Despite Jim's DNF we both had a good time at the race. The weather and scenery were perfect, the race was well-organized and run, and we got to socialize with lots of friends from far and wide. It doesn't get much better than that! I've had some problems determining race stats for 2008. Jim and I are unable to find the FINAL final results of the race on the Eco-X web site A/O November 22. They were there several days after the race, then disappeared when Clark realized there were some mistakes. The closest I can find on this date are here. This link may not work later on; it was the "live results" page during the race and isn't totally right. For one thing, it still lists too many DNFs; some of those were DNSs. Clark says only 229 runners began the race, not 258. Check back later for the corrected overall and age-group results. As best as I can tell, 183 runners finished the race under 12 hours. If 229 runners started, that's an 80% finish rate. If you count the three runners who finished over 12 hours, the finish rate is 81%, right on the norm for this race. As mentioned previously, 43% of the finishers came in during the last hour (and three more after that = 44%). In the days following the race I had some fairly intense e-mail "conversations" with several older female running friends and Clark regarding issues precipitated by an awkward incident at the awards ceremony in which the first-ever 60-year-old female finishers' accomplishments were essentially dismissed. 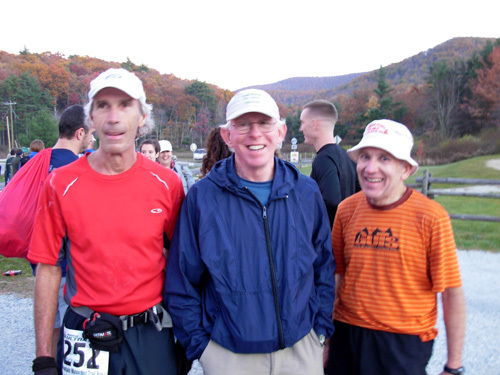 One of these days I'll write an entry in this journal about aging ultra runners that considers races in Virginia and elsewhere with tight time limits, "elitist" policies and attitudes, and unequal or no recognition for older male and female finishers. Even though the topic emanates from MMTR, the problems I'll discuss are certainly not limited to this race. I'll also include a bit about 58-year-old Tom Green, the first Grand Slammer and the only finisher of every MMTR race --until this year. The next entry will not be about running at all, but I think you'll enjoy the photos!